«J’appelle tous les soldats syriens à ne pas verser le sang du peuple syrien», dit ce jeune homme, présenté comme un soldat déserteur, Walid al-Qashami. Vidéo postée le 30 avril 2011 sur Youtube, reprise par Libération. Thomas Stearns, May 3rd, 2011. 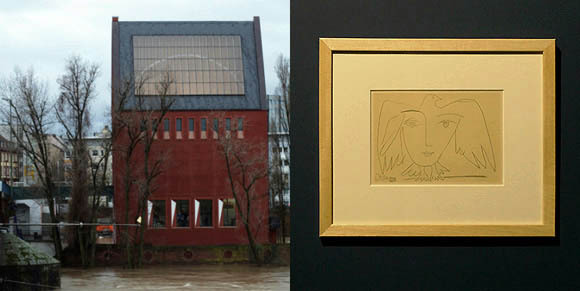 Article à propos de l’exposition actuelle au Portikus: The Future of Tradition: Aranda, Picasso, Matisse, Miro & Vidokle. Genius of course is derived from the latin genius-, or the spark of the divine within each person, a soul. In Roman mythology, the unique tempers of these personal spirits were passed through each generation as a linage—hence the shared root between genus and genius. As such, it should come as no surprise that both Picasso and Matisse called Cézanne « the father of us all ». Such a grounding narrative not only allowed the works of Picasso and Matisse to be legible, it also established their work within a trajectory of ideas—one that stretches to Filippo Brunelleschi, Piero della Franceso & Leon Battista Alberti, who sought a geometric justification for realism so as to brake with the Gothic through an older tradition, « rebirthed. » Could this sympathy be the reason why Matisse often revisited the forms of the odalisque and the themes of arcadia, while Picasso developed a style now know as « neo-classicism »? Even the seemingly iconoclastic Joan Miró, who wished to « assassinate painting » did so not by attacking paintings, nor by producing works in new media like the Futurists or the Dadaists, but did so, counter-intuitively, through painting. Here instead of mere circumscription, these artists hit upon a third idea: novelty within a given discourse is what fosters critical reflection—the measure of which is the ability for a new work of art to form a new reading of the past. To do so, a work is placed into this story by presenting it publically, in a museum for instance, so that its references, appropriations, positions and so on can be layered on to it through that forum. Finally, these fronts slowly integrate as they too become used and made historic. In effect, art is a form of laundering as the proceeds of the artist’s theft are made legitimate through discourse—is there a VW Beatle in Picasso’s Baboon and Young (1951), or is it the face of an animal camouflaged by Picasso? Although these metamorphoses may seem violent, this exhibition instead offers Picasso’s Visage de la Paix (1951) in which our « angle of history » is configured as a face with the wings of a dove as its hair. Here, the classical symbol of a dove is wed to a smiling image of mankind, as peace after all, is about people and their happiness. Gazing back at it though is Matisse’s profile of a woman, identified only as a lot number from a secondary market: S1PAIT5. This personalizing « face-to-face » between the angel and a woman proposes a difference between the two entities that at the same time acknowledges a shared responsibility to accept each other, peacefully. Such volleying is the signature of an « other » as well, namely the curator, Raimundas Malašauskas, who often unites exhibitions through synergistically folded repetitions of theme and variation to form a sum greater than its parts. Guiding the viewers through this play of togetherness, Miró’s Adonides (1975) presents a short two-stanza poem. It begins in a poverty of understanding: I ignore everything I know / and know nothing at all / of all that I ignore. Once affirmed, the poem continues: How can I / believe in death / when I know / that you will die one day. Elegiacally the poet asks, since death is an unknowable, its absence can only be felt in the loss of a loved one, a loss too painful itself to even consider. Thus, death is an uncomfortable mystery. As such, the denial and anger aroused in passing can only be alienated through a mystical faith: the cycle of life and death made whole through incarnation and resurrection—the rebirth. Calling forth this metaphysics, Aranda’s Which can do no harm (and a bone to pick) (2011), hints to a passage in Ezekiel wherein the lord breathes life into a set of desiccated bones. Featuring a mimetic carcass of chicken bones—a common item in divination—formed in unfired dry clay, the material serves as pun for Adam who God made by breathing « spirit » into a handful of earth. Here again we return to the idea of an inspiration, both literal and figurative, repeated in guised form. Yet, this hidden attribution causes little harm as the unfired clay will decompose on its own accord and peacefully return, dust to dust. Rekindling our fire and responsibilities, Vidokle, just as Cassius queried Brutus, asks about Picasso: « Why should that name be sounded more than yours? / Write them together, yours is as fair a name ». Here, Vidokle does just that as the artist sourced a painting on the receipt of a Picasso biography—subtitled « Triumphant Years »—and endorsed the work by signing as its author. It is with this final act that we get to the heart of the exhibition itself, that the future of tradition requires credit.